Wait a second, Etisalat is now 9Mobile ? 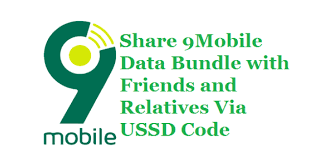 Sharing data to love once could be a little bit fun and a way to show caring to them,and now is easy to share data to loved ones with 9mobile moreblaze family plan, share part of your data bundle with the data balance sharing feature, or simply use your airtime to buy a data plan for someone else with data gifting, just one data plan covers up to four devices with 9moblie multi-device plan. But let say you want send some of your data to a friend. As long as you have at least 100MB of data, you can make a one-off data transfer from your data bundle. You can send between 10MB and 50MB in each transaction, up to five times a day. It works in exactly the same way as an airtime transfer. If you use the internet on more than one device then 9mobile’s multi-device plan is just what you need. With a single plan for your Smartphone, you can get data for up to four more devices. No more relying on wifi hotspots; save battery life. With multi-device you can also buy larger data plans – so you get more data for your money. Your main Smartphone should be your primary device, and is used to set up other secondary devices. If you normally subscribe to a 9mobile blackberry plan, we advise keeping your primary sim in your blackberry phone. To complete the process, you’ll need new, non-activated sims (which must be data SIMs). Make sure you make a note of your puc (personal unlocking code) from the SIM card frame. Sharing data on Airtel could be the easiest of all network because Airtel is gradually reducing all these ambiguous commands on how to carry out simple tasks, meaning that one can share data with friends and family once your recharge your data bundle. To Transfer 25 MB, dial *141*712*9*recipient number#. To Transfer 60 MB, dial *141*712*4*recipient number#. Dial *141*1# and follow the voice prompt. N100 will be deducted for every transaction on data sharing.